To Cite: Jahangiri F, Sayyahfar S, Zarei E, Hoseini R, Nasiri S J . Renal Hydatid Cyst or a Simple Cyst? Report of a Rare Case, Arch Pediatr Infect Dis. Online ahead of Print ; 7(2):e68459. doi: 10.5812/pedinfect.68459. Hydatid disease is a parasitic infection mainly caused by Echinococcus granulosus and is endemic in many parts of the world. Although hydatid disease can be found anywhere in the human body, the liver and lungs are the most commonly involved organs. Urinary tract involvement has been seen in about 2% - 4% of the cases; however, the isolated renal cyst is extremely rare. Here, we report a 5-year-old boy with an isolated huge renal hydatid cyst with no scolices or hooklets in aspirated fluid mimicking a simple renal cyst. The clinicians and radiologists should consider hydatid disease in the differential diagnosis of cystic lesions found in any part of the body especially in endemic countries since earlier diagnosis is crucial for appropriate treatment. Hydatid disease or echinococcosis in a human occurs as a result of infection by the larval stage of the Echinococcus (E) granulosus complex, E. multilocularis, E. vogeli, or E. granulosus (1-3). This parasitic disease has a worldwide distribution and is mostly found in sheep rearing regions such as Asia, especially the Middle East, India, China, Eastern Africa, central Europe, and some parts of South America (2, 3). Although, almost every part of the human body may be involved due to the hematogenous dissemination; the liver (75%) followed by the lungs are the most commonly involved organs. However, in 10% of the cases, the disease occurs in other parts of the body (1, 2). Although the kidney is the third most common location, renal hydatid disease (RHD) is rare and represents about 2% - 4% of the cases of hydatid disease even in endemic regions, and isolated renal involvement is even rarer (2, 4). Although, it is most often unilateral and isolated (5, 6), a few cases of multiple and bilateral involvements have been reported in the literature. Here in, we report an isolated huge renal hydatid cyst in a 5-year-old boy presented with a right upper quadrant (RUQ) mass and vague pain without any scolices or hooklets in aspirated fluid mimicking a simple renal cyst. A 5-year-old boy without any remarkable medical history was referred to our hospital with chief complaint of right upper quadrant mass and vague pain presented for a few months. Except for a palpable mass in the right upper quadrant (RUQ) of the abdomen, the rest of the physical examination was normal. Complete blood count, renal and liver function tests, urine analysis, and electrolytes were within normal range. The abdominal ultrasound revealed a huge simple cyst measuring 96 × 75 mm that nearly occupied the right kidney entirely. No evidence of solid components or calcification was found in the renal cyst. The contrast-enhanced CT scan verified the ultrasound findings (Figure 1). Figure 1. Contrast enhanced abdominal CT scan showed a huge simple cyst occupied nearly entire of right kidney. The chest X-ray was normal. Regarding the isolated renal involvement simplicity and the size of the cyst our primary diagnosis was a huge simple renal cyst without any suspicion of RHD despite the endemicity of the hydatid disease is in our country. For more evaluation, we performed percutaneous aspiration of the cyst under ultrasound guidance. The cyst contained clear fluid. Microscopic examination revealed a hypocellular smear composed of a few PMNs in a proteinaceous background with no scolices or hooklets in the aspirated fluid. The diagnosis of the simple renal cyst was established and the patient discharged in good condition and complete resolution of the cyst with post-aspiration ultrasound. Surprisingly, follow-up ultrasound after 3 months revealed a huge right renal cyst measuring 125 × 80 mm with a floating membrane appearance and diffuse internal echo suggestive for renal hydatid disease (Figure 2). Figure 2. Abdominal ultrasound revealed a huge right renal cyst with a floating membrane appearance and diffuse internal echo suggestive for renal hydatid disease. Enzyme-linked immunosorbent assay (ELISA) was negative. The child underwent a laparotomy with the primary diagnosis of RHD. The cyst was sterilized with hypertonic saline and the endocyst was removed completely. The histological report showed the characteristic laminated membrane compatible with renal hydatid disease. Post-operative albendazole was given for 3 months. The child showed no evidence of recurrence on the 1-year follow-up. Hydatid disease remains a major problem in endemic areas and affects both humans and other mammals. The adult Echinococcus granulosus resides in the small bowel of dogs or other canids as the definitive hosts. After ingestion of eggs (by an intermediate host such as sheep) that are released in the feces by gravid proglottids, the egg hatches and releases an oncosphere that penetrates the intestinal wall and migrates into various organs, especially the liver and lungs through the circulatory system. The oncosphere develops into a cyst that enlarges gradually, producing protoscolices and daughter cysts. The definitive host becomes infected by ingesting the infected organs containing the cyst. After ingestion, the protoscolices attach to the intestinal mucosa and develop into adult stages (1). The human is the accidental intermediate host infected through contact with a definitive host or by handling the soil or dirt or even ingesting the water or vegetables contaminated with the eggs (7). The clinical manifestations of hydatid disease are variable and are determined by the location, size, and the complications of the cyst. Although the infection may be acquired in the childhood, most cases become symptomatic and are diagnosed in the adulthood due to the slowly growing nature of echinococcal cysts; only 10% - 20 % of the cases are diagnosed in patients younger than 16 years of age (1). Since the cyst’s growth is slow (at a speed of approximately one centimeter a year), most patients with RHD are asymptomatic. By increasing the size, the mass effect may cause dull flank pain, a palpable mass, or hematuria. Also, type 1 hypersensitivity reaction (urticaria or even anaphylaxis) may happen secondary to cyst rupture (8). Surprisingly, although our patient was only 5-years-old, the size of the cyst was even larger than his opposite kidney, which misled us to the wrong diagnosis of the simple cyst. In 5% - 10 % of the cases, the cyst may communicate the collecting system, resulting in hydaturia (pathognomonic for RHD) manifested by renal colic and passage of urinary debris resembling grape skin. Usually, RHD in children is asymptomatic and diagnosed incidentally by ultrasound or palpation of a mass during the physical examination as our patient that had no significant sign and symptom except a vague abdominal pain and an intra-abdominal palpable mass pre-operative diagnosis of RHD is difficult even in endemic regions. There is no specific sign and symptom that can reliably confirm the diagnosis of RHD. In addition, the sensitivity and specificity of most laboratory tests are not high to diagnose it definitely, regardless of hydaturia. Although eosinophilia may be seen in about 25% - 50% of cases, it is a non-diagnostic test. The result of the casoni test is also unreliable in most of the cases (2, 9). The serologic tests are used when the diagnosis is doubtful, however, a negative result does not rule out RHD, due to the fact that these tests may have false negative results, especially in uncomplicated intact viable cysts, which are the most frequent type in children (1, 4). Our patient had negative ELISA despite the final diagnosis of RHD that confirms this point. In addition, direct microscopic examination of the aspirated fluid from a suspected cyst and alternatively Latex agglutination test (LAT) of the fluid could be used as a simple diagnostic examination (10). Surprisingly, the aspirated fluid examination revealed no scolices or hooklets in our patient. In cattle hydatid disease, sterile cysts have been reported (10). Counter-immune-electrophoresis against arch 5 has been shown to be highly specific for hydatidosis (79%) (11). It is an ELISA and the antigen used is commercially available, and purified to elicit an arc 5 precipitation line by immunoelectrophoresis with sera of patients with hydatid disease. The ultrasound and CT scan are the most important diagnostic tools that are helpful for RHD diagnosis and treatment planning. The ultrasound is a sensitive modality for identifying abdominal hydatid cyst and is useful for evaluation of its internal structure (septation and hydatid sand within a cyst), size, location, and the cyst’s communication to other organs. It is also the method of choice for following-up the patient and evaluating the response to the treatment (12). CT scan provides information equivalent to ultrasound for diagnosis for RHD and gives better information about the cyst calcification and complications. A CT scan is also highly sensitive but nonspecific for the diagnosis of RHD and other differential diagnoses such as the simple kidney cysts, hemorrhagic cysts, abscesses, and tumoral masses, all of which must be considered (12). Regarding these problems, the pre-operative diagnosis can be suggested by the combination of epidemiologic, imaging, serological, and urine findings. If the pre-surgery diagnosis of hydatid disease has not been established by imaging and serological tests, a definite diagnosis could be made before therapy by demonstration of protoscolices or a hydatid membrane in the liquid obtained by ultrasonographically-guided percutaneous aspiration of the cyst (1). The treatment of RHD is mainly surgical and various surgical options are available. Kidney-sparing surgery and cystectomy plus pericystectomy are feasible in 75% of cases and total nephrectomy must be performed for non-functional kidneys (2, 5, 8, 12, 13). If being unilocular, renal hydatid cyst can be treated by sonographically-guided percutaneous aspiration, injection, and re-aspiration (PAIR) technique. A post-operative course of Albendazole should be administered to reduce the probability of recurrence (1, 8). In conclusion, the diagnosis of RHD remains a challenging dilemma even in endemic countries. The radiologist’s familiarity with imaging features of the RHD is very important for earlier diagnosis and appropriate treatment. Although the definite diagnosis of hydatid disease requires direct visualization of scoleces on pathologic examination, the negative microscopic examination may not rule out the diagnosis. RHD must be considered in differential diagnosis of any cystic lesion of the kidney, especially in endemic countries. survey could not have been successfully conducted. Conflict of Interests: No conflict of interest has been expressed by the authors. Ethical Approval: The study was approved by the Ethics Committee of Iran University of Medical Science and complied with the Declaration of Helsinki. Informed Consent: Informed consent was obtained from the patient. 1. Moro P, Schantz PM. Echinococcosis: a review. Int J Infect Dis. 2009;13(2):125-33. doi: 10.1016/j.ijid.2008.03.037. [PubMed: 18938096]. 2. Chaudhary T, Biswas M, Mittal A, Sarpal R, Agrawal S, Shirazi N. Isolated cystic renal echinococcosis: a rare case report. Int J Surg. 2016;3(3):1627-9. doi: 10.18203/2349-2902.isj20162760. 3. Imani M, Tizmaghz A, Shabestanipour G. Hydatid cyst presentation as an inguinal mass. 2018. 4. Moscatelli G, Moroni S, Freilij H, Salgueiro F, Bournissen FG, Altcheh J. A five-year-old child with renal hydatidosis. Am J Trop Med Hyg. 2013;89(3):554-6. doi: 10.4269/ajtmh.13-0243. [PubMed: 23897992]. [PubMed Central: PMC3771299]. 5. Rami M, Khattala K, ElMadi A, Afifi MA, Bouabddallah Y. The renal hydatid cyst: report on 4 cases. Pan Afr Med J. 2011;8:31. [PubMed: 22121440]. [PubMed Central: PMC3201596]. 6. Shah N, Patel M, Agrawal V, Patel M. Hydatid cyst of the kidney: a case report and review of the literature. Int J Health Res Med Sci. 2016:5071-6. doi: 10.18203/2320-6012.ijrms20163821. 7. Nirmala BV, Devi TS, Sireesha A, Moorthy N, Kumar OS, Padmaja GV. Common lesion at an uncommon site : An isolated renal hydatid cyst. J Evid Base Med Healthc. 2015;2(6):778-82. doi: 10.18410/jebmh/2015/111. 8. Waters-Rist AL, Faccia K, Lieverse A, Bazaliiskii VI, Katzenberg MA, Losey RJ. Multicomponent analyses of a hydatid cyst from an early neolithic hunter–fisher–gatherer from lake baikal, siberia. J Archaeol Sci. 2014;50:51-62. doi: 10.1016/j.jas.2014.06.015. 9. Mongha R, Narayan S, Kundu AK. 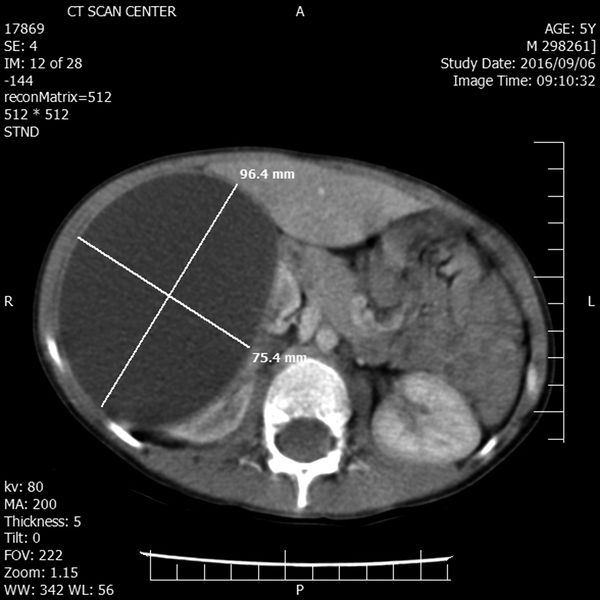 Primary hydatid cyst of kidney and ureter with gross hydatiduria: A case report and evaluation of radiological features. Indian J Urol. 2008;24(1):116-7. doi: 10.4103/0970-1591.38617. [PubMed: 19468374]. [PubMed Central: PMC2684251]. 10. Chandrakesan SD, Parija SC. Latex agglutination test (LAT) for antigen detection in the cystic fluid for the diagnosis of cystic echinococcosis. Diagn Microbiol Infect Dis. 2003;45(2):123-6. doi: 10.1016/s0732-8893(02)00479-0. 11. Bhirud P, Bhirud P, Kankalia S. Isolated renal hydatid cyst with ureteric calculus in human immunodeficiency virus (HIV) infected patient. Med J Dr. D.Y. Patil Univ. 2014;7(3):377. doi: 10.4103/0975-2870.128991. 12. Pedrosa I, Saiz A, Arrazola J, Ferreiros J, Pedrosa CS. Hydatid disease: radiologic and pathologic features and complications. Radiographics. 2000;20(3):795-817. doi: 10.1148/radiographics.20.3.g00ma06795. [PubMed: 10835129]. 13. Fahimzad A, Karimi A, Rafiei Tabatabaei S, Armin S, Ghanaei RM, Fallah F, et al. Overview of hydatid disease in iranian children. Arch Pediatr Infect Dis. 2015;3(3). doi: 10.5812/pedinfect.30084v2.